And so it was that Grace somehow managed to come up with the most innocent and least likely to unintentionally reveal anything plan ever, and STILL psyched herself out. In any case, my apologies to anyone who spent the weekend dreading things based on the super smiley Grace face we left off on last Friday. Part of me wanted to clarify this was her plan then so that wouldn't happen, but I feel it works better on this page than crammed onto that page (y'know, when there isn't a weekend between seeing said pages). This is based on my experiences with having a comic shop ordering and/or holding comics for me, and the agreement I had to agree to. As they were either special ordering comics, or keeping them off the shelves, it made sense that they protected themselves from people asking for a bunch of stuff to be held for them and then just never showing up. 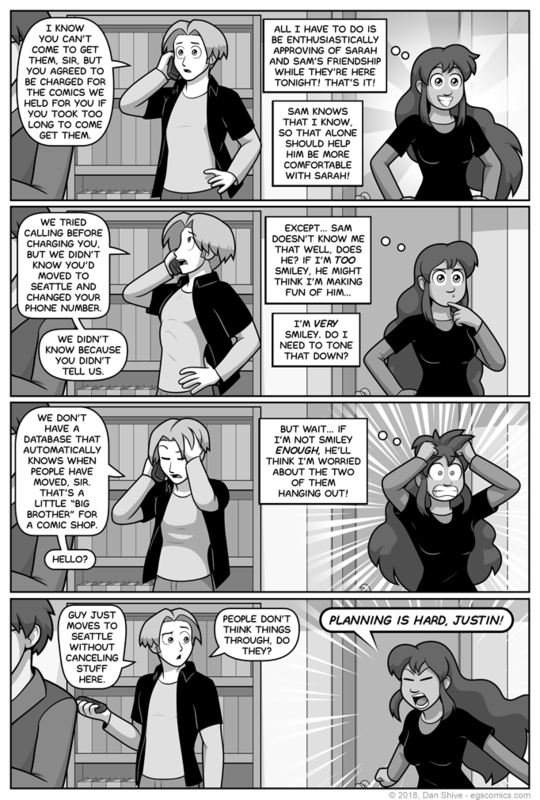 Given the way people can be, I can't help but think the scenario presented with Justin in this comic isn't the least bit far-fetched.